Please welcome K. M. McKinley to The Qwillery. The City of Ice (The Gates of the World 2) was published by Solaris on December 27, 2016 in the US and Canada and is published January 12, 2017 in the UK. TQ: Welcome back to The Qwillery. Your new novel, The City of Ice (The Gates of the World 2), was published on December 27th. Has your writing process changed (or not) from when you wrote The Iron Ship (Gates of the World 1) to The City of Ice? K. M.: Hi! Thanks for having me back. My writing process changes all the time. I write a lot, and have to vary my writing to keep it interesting for me or I would go insane with the tedium of repetition. In the case of The Iron Ship and The City of Ice there was one marked difference - with the first book, I wrote quite a bit of it as single narratives, so I did all of Guis’s bits and all of Rel’s bits and so on almost like separate books, then shuffled them together. I use Scrivener, a godsend for that sort of process. 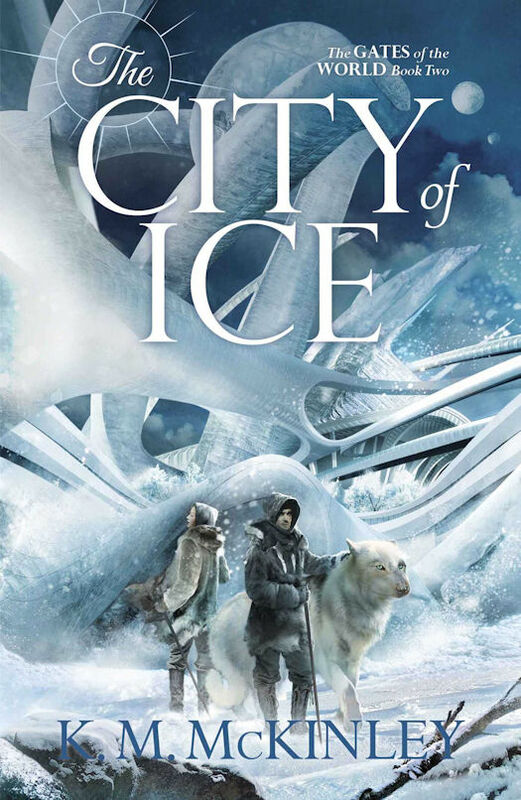 Whereas I wrote The City of Ice pretty much as it appears in print, having planned it out more closely than book one, although I jumped around a lot from place to place as I often do, and the plan did change. TQ: What do you wish that you knew about book publishing when The Iron Ship out that you know now? K. M.: I’ve been involved with publishing for a long time. It holds very few surprises! TQ: Tell us something about The City of Ice that is not found in the book description. K. M.: Well, there is a ton of incident in this one. 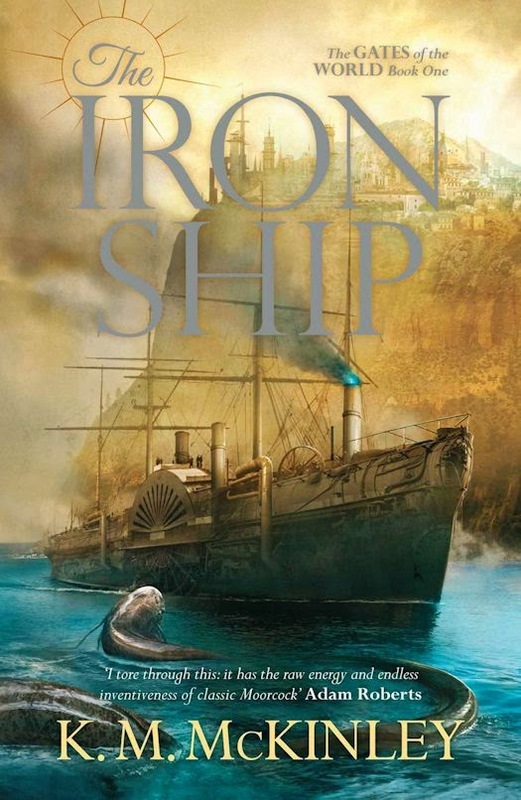 Having spent a lot of time setting up the world in The Iron Ship, I wanted to make book two a really exciting read, something I’ll continue with in book three. A lot happens in this book, and I answer a fair few questions posed in the first. I didn’t want to do a “Lost”, which established a load of mysteries then wholeheartedly avoided giving them any sort of resolution. Hopefully what the actual central mystery is is beginning to crystallise now in the reader’s mind. TQ: Which character in the The Gates of the World series has surprised you the most? K. M.: Hmmm. I don’t know. I’m happy with them, which I rarely am. They approach the realism I strive for in my made-up people. As usual, I’ll add the caveat to my thoughts that if I succeeded or not is not for me to judge. None of them were particularly hard compared to the others. All writing seems massively hard while you are doing it, then looks suspiciously easy in retrospect. Getting the tone of Madelyne’s story arc was tricky. She’s a new character for this book who gets involved with the second of Ruthnia’s last gods, the Infernal Duke, who lives in Perus - that’s the city where much of this book is set. Her part of the story is all about power exchange dynamics in sexual relationships, although there is a dark fantasy twist absent from the real thing. I had a specific aim in mind for this story arc, it’s a kind of warning in some ways, a celebration in others. But it could very easily have gone a bit Fifty Shades of Grey, and I wanted to avoid that. I didn’t want Madelyne to appear weak or a sap, while at the same time I had to have what happens to her seem believable and to accord with her character as a strong woman. You’ll see what I mean if you read it. TQ: How difficult or easy is it to write siblings? K. M.: Pretty easy. I have a lot of them myself. I’ve drawn on my own experiences with these books more than for any other thing I have ever written (barring out and out reportage, even then that was never very personal). It was another goal with this series, to write about really, really personal stuff. That’s always dangerous, though. The brother I based Trassan on in particular loves these books. I hope he isn’t offended by the character, it’s pretty close to the knuckle in places. TQ: Please tell us about your wonderful covers. K. M.: I can say that Alejandro Colucci's take on the swooping curves and lines of the city of ice itself inspired my descriptions, as the cover was completed before I had written the book. It’s good to get that kind of synergy between image and words. TQ: Why have you chosen to include or not chosen to include social issues in the The Gates of the World series? K. M.: You asked me this last year! I always have “issues” in my books, though to make them overly preachy makes them tedious hectoring rather than storytelling. Where there are issues, there is friction, and where there is friction, there are good stories. This is a world gripped by change, and the society there is undergoing upheaval. I return to the plight of the workers in Ruthnia’s new industries for a bit, and again we’re looking at how women can prosper in patriarchal societies. But you know, I don’t want to over-politicise my work. There are insights into my personal philosophies and politics to be had here, but bear in mind other issues in this world include the rights of non-human magical creatures and talking dogs, and the overuse of magic, which would be ridiculous in our world, but in the context of theirs are every bit as important as how many hours six year-olds have to work every day. The use of social issues only gets you so far in storytelling, and it is very easy to get it horribly wrong in several embarassing ways, especially if you approach them with the word “issues” in mind. “Issue” implies a partisan approach to a particular phenomenon. I try hard to see things from all sides. TQ: Please give us one or two of your favorite non-spoilery lines from The City of Ice. K. M.: Firstly, all the best lines are immense spoilers. There are plenty of twists and revelations in The City of Ice. Secondly, I maintain that it’s not up to the writer to choose the best lines from a book, but for the readers. I squirm when asked to sing out how awesome my writing is. I know that’s what you are supposed to do in this internet day and age, but it seems so immodest, and I hate doing it. K. M.: I’m always working on various things, but soon I begin work on book three of The Gates of the World, The Brass God, which has been commissioned and should be out next year.